Casino Reissue, Hollow Body/Semi Hollow Body Electric Guitar from Epiphone in the Casino series. It seems that Epi's have improved over the last few years. The tuning keys are decent, although not great, but still far better than the past. The sound is quite nice for clean tones, and light drive. It's easy and fun to play, sounds like a champ. I figured the sound would have been a bit brighter, but it's still quite nice. I'd prefer that the unit had a better set of tuning keys. The binding up the neck is a bit rough, but pretty good. Not bad at all... Again, tuning keys could be better, nice fretwork, well potted pickups, very good finish... I'm not sure how much I'd risk roughing this up, it seems a little fragle on the body side of things. At this price point, It's a great guitar. If you want to use heavy distortion, this will NOT work, I guarantee it will feed back like nobody's business. For bright clean jangling tones, or some light drive, it's a great instrument. For this price, it's a gem. wanted a hollow body w single coils for the blues and vintage rock sound. Music 123 for 550.00 w case. I like it all eccept the tuners but they will do.This guitar is flawless. It sounds good without plugging it in for practice. Ihave 6 other guitars but pick this one up the most to practice. I can see why this was lennons favorite guitar. The tone sings and it is great for the blues. Mine is torguise, white binding on the body and neck. With the chrome hardware and chrome p90 dog eared pickups it looks like a 56 t-bird(the car).But its the sound that sets this guitar apart. It will feedback if your close to the amp or in high noise situation.The pickups are reverse wound so you can put it in the middle position and tone down the other pickup to get rid of the noise if you have to.But this is how it is with hollow body single coils. I have played guitars much more expensive and they dont stack up to this guitar. If this was lost or stollen I would replace it asap. I replaced the tunners with grover minis.But I am pickey. A1 I have seen some gibsons not as good. If your looking for the p90 sound and want an electric you can practice with unplugged this is it.I have played rock, blues, country with it It is great. Heavy metal no. I use a strat or a les paul. If I was looking for my first electric(not heavy metal) I would recommend it.I play this guitar the most eccept for a modified super strat. I used a d35 martin to practice with before the casino now I mostly play the casino.I think epiphone does a good job for the bucks. I like the lightness of the body and the fact that it has some volume when it isn't plugged in because it is a hollow body. It has a great crunchy tone wich really cuts through, like the rhythm sound on The Beatles' "Revolution". There is not really anything I don't like about this guitar. It rocks. 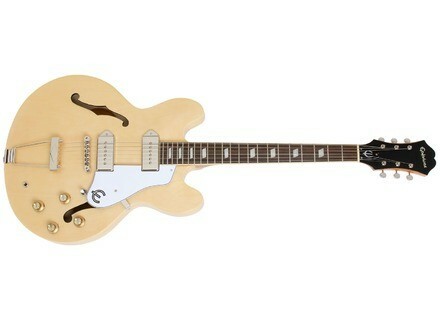 This is a beautiful looking guitar as well as great sounding. It feels very solid even though it is a hollow body. The bottom line is that this guitar gives me the crunch and cut I was looking for as well as being a guitar I can strum in my bedroom like an acoustic unplugged. Now I know how the Beatles got their sound;. I purchased this guitar when I lived on the West coast of Florida in Clearwater at Thoroughbred Music which has since been purchased by Sam Ash Music. The guitar was only slightly used and I payed only $400 for it which was a steal since new units run upwards of eight or nine hundred. For a hollow body electric or archtop as Gibson and Epiphone refer to them, it plays with substantial volume and tone unamplified, which is nice for practicing. When I play this guitar through my Crate TD-50C Chorus amp, the P-90's provide a very powerful yet creamy and full tone. The large parallelogram inlays on the fretboard are very easy to see and are attractive as well. Aside from the great playability of this guitar I really fell for the beautiful natural blonde maple finish. The only feature I do not like about this guitar is the pick guard constantly vibrated at an aggravating and very noticeable level when I played the guitar unplugged. Since I have removed the pick guard all the bad vibrations are gone. I assume that this may have been a problem for some time since John Lennon removed the pick guard on his Casino. The construction, fit and finish of this unit is of a very high quality, especially considering the price range that it sells in. Having owned this beauty for several years now, I have had a chance to closely inspect every inch while hand rubbing Axe wax into the finish. Even after all this time I am amazed at the fine construction and finish. This instrument is a pleasure to play and it always draws complements from even those who don't play. Epiphone is bringing back the first Casino in celebration of it's 50th anniversary - the "1961" Casino.